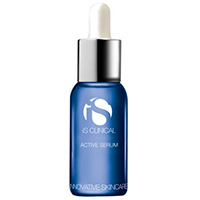 iS Clinical Active Serum our exceptional multi-purpose formula, is designed to generate rapid and dramatic improvements in overall skin quality. ACTIVE SERUM diminishes fine lines and wrinkles, evens pigmentation, smoothes, and controls acne. ACTIVE SERUM is widely endorsed by leading physicians and experts, who describe ACTIVE SERUM as remarkable,amazing,miraculous, and one of the most important discoveries in the field of skincare. ACTIVE SERUM begins working immediately upon application, as demonstrated by an active tingling sensation. This phenomenal formula absorbs deep within the dermal layers where maximum benefits will be achieved. Extremely sophisticated formulation technology enables ACTIVE SERUM to precisely affect the skin cells themselves, truly providing results on a cellular level. L production while increasing overall cellular integrity. Even treats cystic acne. Key ingredients: Glycolic Acid, Lactic Acid, Salicylic Acid, Arbutin Glycoside, Kojic Acid, Menthol. IS CLINICAL is a product line of INNOVATIVE SKINCARE. They are a revolutionary cosmeceutical company designed for the new millennium. Pioneering a new strategy in the skincare industry, there persona is uniquely scientific, distinctively sophisticated and entirely contemporary. They carefully assembled a team of world-renowned pharmacologists and physicians, who are responsible for some of the greatest advances in the fields of skincare and anti-aging medicine. In addition, there team includes experts in the areas of: cosmetics, protocol training, and marketing. Active Serum -Active Serum causes rapid and persistent clearing of sun damage, acne, and dry skin Increases hydration of the skin increases absorption of medications and moisturizers the skin does glow after use.